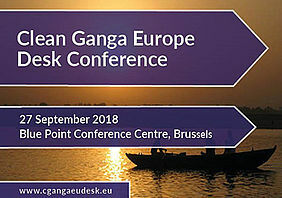 Clean Ganga Europe Desk Conference 2018 offers the chance to connect with Indian and European high level stakeholders and actors with a common vision to tackle water issues in India. The conference is organised within the cooperation framework of the India-EU Water Partnership, the EU Delegation to India and VLAKWA/VITO, with the support of the Indian Embassy for Europe, Luxembourg and Belgium, the European Technology Platform on Water Supply & Sanitation (WssTP), and the Belgium India Chamber of Commerce and Industry (BICCI). The event will offer the unique chance for interested European institutions and companies to learn about upcoming opportunities for partnering with India on water related challenges, in particular regarding the cleaning of the Ganga River. Targeted contributions and discussions will link Indian and European stakeholders towards joint, future actions in Indian water resources management as well as Ganga Rejuvenation. For more information, please contact Ioana Oprisan.